SAN FRANCISCO— The 9th Circuit U.S. Court of Appeals today affirmed the right of American and Japanese conservation groups and Okinawan citizens to sue to compel the U.S. military to fully consider the impacts of a new U.S. military base in Okinawa, Japan. The base would pave over some of the last remaining habitat for endangered Okinawa dugongs, ancient cultural icons for the Okinawan people. The lawsuit is part of a long-running controversy over the expansion of a U.S. Marine air base at Okinawa’s Henoko Bay. Preliminary construction on the base began earlier this year. After conservation groups and Okinawan community members filed a lawsuit to challenge the U.S. government’s inadequate assessment of the proposed new military base’s impacts on the dugong — including failure to consult with the relevant stakeholders or adequately consider all possible effects on the dugong as required by law — the government argued that the district court could not consider the case because of its foreign-policy implications. The court of appeals today disagreed, holding that the plaintiffs had standing to sue, and that the fact that the case related to a project in another country did not give the government license to ignore the requirements of U.S. law. The court remanded the case to the district court for further proceedings. 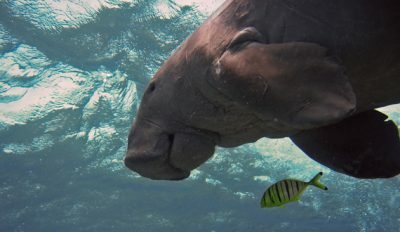 Dugongs are gentle marine mammals related to manatees that have long been revered by native Okinawans, even celebrated as “sirens” that bring friendly warnings of tsunamis. The dugong is listed as an object of national cultural significance under Japan’s Law for the Protection of Cultural Properties. Under the U.S. National Historic Protection Act and international law, the United States must take into account the effect of its actions and avoid or mitigate any harm to places or things of cultural significance to another country. In 1997, it was estimated that there may have been as few as 50 Okinawa dugongs left in the world; more recent surveys have only been able to conclude that at least three dugongs remain in Okinawa. The Defense Department has authorized construction of the new base, despite the precariously low dugong population estimates. “Paving coral reefs for a military airbase runway does not make us safer, but more vulnerable to planetary extinction. The Okinawa dugong, sea turtles, coral reefs and the ocean environment are the winners today in this 14-year litigation battle with Department of Defense,” said Todd Steiner, executive director of Turtle Island Restoration Network. For years many locals have protested and opposed the base-expansion plan for Okinawa, where 20 percent of the island is already occupied by U.S. military. This lawsuit was originally filed in 2003 by Earthjustice on behalf of the U.S. organizations Center for Biological Diversity and Turtle Island Restoration Network; the Japanese organizations Japan Environmental Lawyers Federation and the Save the Dugong Foundation; and three Japanese individuals.